An air conditioning filter should be changed every month or every two months for home air conditioning systems and every couple of weeks for certain commercial or industrial air conditioning since it's running almost 24 hours a day, 7 days a week. Doing this as a routine in your monthly chores and not waiting until you see dust matted on the air conditioning filter will ensure you and your family the very best health as well as a smooth running air conditioning system . 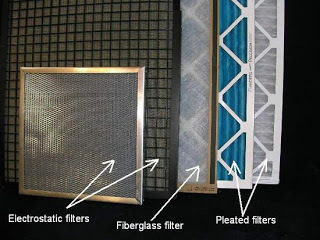 Dust particles can not always be seen so even if you see a little dust on the air filter , clean it as you normally would.